We'd like to congratulate BIGGUY - Jim for being selected as the April 2017 Member of the Month! Hayden: Tell us a bit about yourself (age, family, school/job, hobbies, where are you from, how long you’ve lived where, etc. )[Basically anything you’re comfortable sharing as if you were meeting someone new for the first time]? Jim:I was born 55 years ago on April 2nd in N ID. My Dad worked at the silver mines as a hoistman and Mom stayed home until they divorced and then she worked as a cook at the local Nursing Home. I have a sister and brother who are 6 and 7 years younger than me. Both parents remarried and I have an adopted Step Brother from my Dad’s new marriage and a Step Brother and Step Sister from my Mom’s new marriage. I have a niece from my brother and twin nephews from my sister. I lost Mom back in 2011 and Dad in 2012. I went to HS and after graduation in 1980 I went to trade school for Auto Mechanics and got my degree. The mines and logging which were the main jobs In the area were being shut down so I ended up working for a couple of years in the restaurant I had started working in during HS. I then went to a year and a half of college until I couldn’t afford it anymore. My Mom and Stepdad had moved to WY when he lost his mining job and he got on at one of the Trona mines and then laid off and back on a few times finally getting a mechanics job at the Power Plant here and Mom worked at McDonalds. They told me to come down that there were jobs in the area soI moved here in February of 1985. I started working at McDonalds to have gas money and money to get me by while looking for a better job and after a month became a Shift Manager there. Then in January of 1986 I got a job at the power plant as a maintenance helper working with the mechanics and the electrical techs. I held that job for 3 ½ years and then moved to a fuelman helper’s job which meant that I was working with the fuelmen who ran the crushers, conveyors, and other equipment that dealt with the fuel for the boilers along with training to become a fuelman myself. I did that for 6 months and then became a Fuelman which I was for a year and a week and then I went to class to become and operator. I went to class for 6 months and then 6 months on the job and passed my tests and became a Scrubber Operator running the emissions equipment for the plant. I did that job for 20 years until I was put on disability and then retired out early in January of 2012 just a couple months shy of my 50th birthday. I had 26 years in working at the plant. I’ve lived in WY for 32 years and counting now. I like to cook, camp, shoot, eat, 4wheel, take photos, read about history and check out different sites I can find in the area. I used to read a lot of WWII history mostly and then after I retired I got more into the history of the area here and the old west since all of the Immigrant trails pass by here and there are some old forts, the railroad was first put in through the area too and then to the south of me is an area on the Outlaw Trail known as Browns Park near the 3 corners area where WY/CO/UT meet up. People like Butch and Sundance and the Wild Bunch spent time there and the outlaw/lawman Matt Warner had a ranch nearby. Harvey Logan also known as Kid Curry spent time there and was of interest to me as he killed a man in MT known as Pike Landusky who is buried on what was my Uncle’s ranch as that’s where my Dad’s family settled back in the 1800s and Harvey was a friend and neighbor of the family back then. Lots of neat stuff to research and see with historic sites all over here. Hayden: How/when were you first introduced to the forum and what made you decide to join? Jim: I was looking into getting a new vehicle to replace my old 1990 Toyota pickup that I had bought brand new. It was getting old and by the time I got rid of it in 2010 I had owned it for 20 years and over 485,000 miles. I didn’t really like the new Tacoma that had just come out and the 4Runner wasn’t that much different than the 1990 one I was driving as my 2nd vehicle. I was looking at stuff online like Jeeps and used vehicles to find something when I saw some info about the FJ Cruiser being put into production and a link to the forum. That was in I think December of 2005. I had no idea what a forum was at the time and just came on to read and find info on the FJ. It was exciting because people didn’t know much and there were people that would post up any little tid bit of info they saw and then someone would post a photo from one of the lots near a port that had several FJs just off the boat from Japan parked and waiting to be shipped to the dealers. Then people started to buy them and mod them and the rest is history. It was neat to be a part of that. I finally decided to join up and have been around the forum as a member and as a lurker for a little over 11 years now. After researching and seeing what the FJ was all about through the info here I ended up purchasing mine in August of 2006. Hayden: Is the FJ Cruiser your first off-road vehicle? If so what led you to owning an FJC? If not, what was your/the first vehicle you took wheeling? Jim:I started out as kid riding motorcycles and then my first car was a 1968 VW Type III Fastback which I took all over on the dirt roads camping and fishing as a teen. Later on I bought my first 4x4 in 1990 which was a Toyota Extra-cab pickup with the 3.0v6 and a 5speed. It was a Deluxe model or really a base model. No A/C, cruise, tilt, power windows or locks and the only real option was the factory 31” tire and wheel package and the 4:56 gears that came with it. It was a great truck as I mention above. I also added a 1990 4Runner with the 3.0v6 and the automatic and it was a fun truck too and both of them were red and looked almost the same. I’ve also had 3 Polaris ATVs in that time too. I was looking for that new vehicle and ended up trading the 4Runner in on the FJ as it looked to be the best vehicle for me and what I was doing. I had been going to Moab with a friend for a few years and we both gunned on trails for the Easter Safari as RR4W Club Members. Really I’ve spent a lot of my youth out in the woods on trails and dirt roads and it’s something that I loved and carried on with as I got older. Hayden: I know you’ve parted with your FJ, but what modification was your favorite or was the most worth the money/time/effort that you’d recommend it to someone else? Jim:That’s hard to say. I built my FJ in basically on big session of mods at once and things were picked to work together. I had the skids, sliders, bumpers, dual battery, lights, Tuffy drawer, seat covers, tires, and suspension done all at once and then later I had the swing out carrier put on. I had never really done much in the way of mods to my vehicles before. If something broke or wore out it was replaced with OEM mostly and in some cases I’d upgrade to an aftermarket. I liked all of the mods for what they did and how they made the whole package. I guess if I really had to pick one thing it would be the suspension as the ride was so much better and I gained some clearance too. My FJ was stock until 2008 when I went to the Summit and then Moab and I got hooked again on 4wheeling. I had also went up and down a ledge and put 2 holes in the front and 2 in the rear bumper cover and decided that since I was working a ton of OT that I’d buy some mods and do the FJ up. Really about the best thing I can say is to research, ask questions, and listen to what others recommend so you can put together a setup that works for you and your budget and what you want to do so you aren’t replacing things one or more times down the road. Hayden: What upgrade was your least favorite, or what modification would you do differently if you had to do it over again? Jim:I guess I’d have to say my rear suspension. I had springs on it at first that weren’t up to the task of holding all the weight of a rear bumper, swing out, gas cans and gear so I had them swapped and I went with some WE 2.0 shocks which only lasted about 30K miles until they blew a seal and then I had one that was messed up and had to be cut off so I went to a set of 2.5 and they only last the same amount of miles. If I did it again I’d go with something else for the rear and hope that it would last like the front coils and OME shocks which were installed as part of the suspension at first and were still going strong when I traded the FJ off. Hayden: What led to your decision to part with your FJ and do you ever plan to own another one? Jim:I love my FJ and still miss it. It got to the point though that my back wasn’t up to going to Moab anymore or doing the hard trails so the FJ wasn’t being used like it should. I also had a problem getting up into it with the lift on it. What finally sealed the deal was when in the last year I ended up putting $7000 into it for a set of tires and repairs. I lost confidence in it. I ended up having the whole front end rebuilt and then I lost 3 injectors, a primary catalytic converter, and two sensors. I also had a bad charcoal canister that I didn’t replace. The front end was partially caused by a lot of dirt and off road running that finally wore it out so that was something that could be expected. I have no idea what caused the injectors to fail which is what took out the cat and so on. Originally I had planned on keeping the FJ and buying a Tacoma to fix up the same way but after driving one for a week while the repairs were being made I realized that I couldn’t be comfortable in the Tacoma as it’s a small truck and I’m a big guy. I also really couldn’t afford both vehicles at the time. I drove the Tundra and ended up trading the FJ on it. I would love to have another FJ at some time in the future. Hayden: Did anyone on the forum inspire your build or has been a go-to resource for you? Jim: ]I can’t really name one person as I read and took the info from so many builds and discussions to figure out what I wanted and then pieced things together in a package. Hayden: Where all have you been with your FJC? What trail/park/location is your favorite? Jim: I’ve been on trails in CO near Longmont, Ouray, and then the highways near there and down to Durango and over to and south of Telluride. I’ve been to several places in UT including Moab and then all around my little area here in WY. Moab will always hold a special place in my heart for being a favorite place to go and Ouray is another because of the scenery. Hayden: What trail/park/location that you have not been to yet would you like to visit? Jim: Wow another hard one. Lots of places in CO and UT along with some in WY and beyond. I just want to travel the region and see what’s out there. Hayden: Being located in Wyoming what is the FJ community like there? Do the local FJers get together to go wheeling or have any other meet-ups? Any neat annual events located in the area? Jim:I was surprised at how many FJs were actually in the area for such a small population. The first 2 or 3 showed up before I bought mine and at one time there were about 33 of them in the area and there are only 43,000 people In the county. There were almost one of every color and all of the TRD and the TT models at one time. A lot of them are now either gone or on the lots in town for sale. I met a few of the other owners and there were a couple that I passed who waved that looked like they took theirs off road, but for the most part it was just a quick wave or a short visit at the gas station type of thing and no real meet-ups. About the only annual events we have here are the fair, fishing tournaments, some Mountain Man Rendezvous, and some local events and celebrations with the usual food/drinks/games and a carnival. No off road stuff. I do know 3 other people here in WY that own FJs and I’ve met up with two of them so far. The first one I met was when I was in Moab and they were invited to join us on our runs. I was muddy from Ouray and they were dirty from Moab and we were parked by each other but couldn’t see the license plates. Then we started to talk and realized we were both from WY. They were a couple that go to Moab for their anniversary every year. We keep in touch, but it’s hard to get together as they live up to the northwest of me in Afton. I’ve also met Bar3K and his wife when they came to the area and we took a drive down south to check out the area. They live on the east side of the state from me. I hope to meet the 3rd one which is CabinCruiser this summer who lives to the east of me. Jim:I’d have to say meeting all the different people and becoming friends because of it over the forum and then going wheeling together with some of them. I’ve made several new friends from way back at the beginning up to more recent times and we still keep in touch. Here is my best friend who I let drive at the '08 Summit. A friend by the FJ at the overlook on Last Dollar Road between Ouray and Telluride. One trip down to UT with some of the old members. Hayden:One of your impressive forum feats is that you’re the Forum’s top poster with now over 23,000 posts! How does one become the top poster? Jim:Well as friends and family have said for years now, I don’t know how to shut up. Back in the beginning I asked questions and I also joined in on some conversations a fair amount. I also had a knack for knowing where the best threads on different subjects were so I’d post up links to them for all the new people asking for help. I’ve welcomed a bunch of people and then a lot of posts came from posting up photos of trips, fall colors, etc. in different threads and some of my own. Hayden: What has the FJCruiserForums done for you and what do you feel you contribute to the forum the most? Jim:It’s brought me the joy and fun of seeing a brand new vehicle come to life from a concept I’d read about in a magazine to the showroom floor and then to my house. It’s also let me be a part of a great group of people with the same love and passion for that vehicle and for enjoying it in the many places outdoors and sharing out lives with each other. Through that little funny looking truck I’ve made many friends and I’ve seen pictures and read about their trips and areas along with being able to share my trips and photos with them. Well I try to help others out if I can, but there’s so much info and so many more parts available now that I’m almost as lost as the ones asking the questions anymore. I do try to help with questions on places like Moab where I’m familiar with the area or with questions from people who are traveling through my area and trying to find info. I try to share my little corner of the world with people because I know that some are just as interested in it as I am at finding out about their area. Lately I guess my biggest contribution is killing Spam. Hayden:Even though your FJ is gone what has kept you around here on the forum? Jim:The people I consider friends that are here. Hayden:Now I know you’re quite the story teller, any additional tales for us from your many adventures? Jim:Well there was that time from when I was a little kid. My family took a drive out into the forest and we had a picnic. They got ready to go and forgot to take me with them. It was scary but I eventually was found by a family of squirrels. There was Papa, Mama, and the three babies. They took care of me and taught me to climb trees and store nuts. It was good and things were great until tragedy struck one cold winter night. We were all cuddled up together to keep warm when I rolled over and killed Mama and the three babies. I was so sad. Papa became mad as hell and started biting and clawing at me all the time. It finally all calmed down and things were good again. I hunkered down to get through the rest of the winter and really enjoyed some good 5 squirrel and nuts stew. Hayden: What final advice do you have for someone new to the FJ Cruiser or the Forum? Jim:Buy one and enjoy it. Get out and see some of this big beautiful country we live in or the one you may live in. Go places and meet up with other owners as they are some of the best people and can become good friends and you’ll have good times and memories to last the rest of your life. Here is a link to my build thread with photos of my '90 pickup, '90 4Runner, FJ, and Tundra with more to come on the Tundra soon as I'm adding some mods over the next couple of months. It's also a decent read with info on the mods, trips, and the sad story of when I traded it off on the Tundra. Winterpeg, Unphazed1337, .bg. and 13 others like this. Congrats Jim! You definitely deserve this Member of the Month recognition for being one of the most stand up guys I know here on the forums. Keep on being great and doing what you do! This has been on of my favorite threads to read through to date, what a story you have! Thanks for sharing! 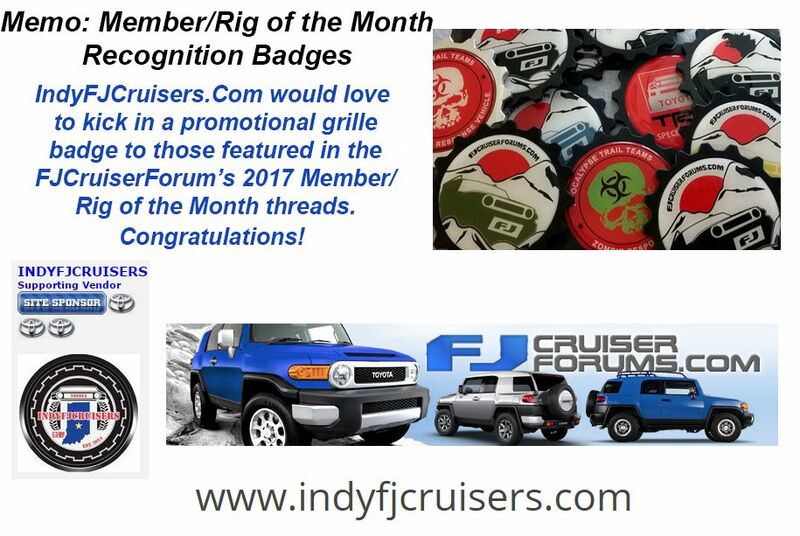 And don't forget to contact IndyFJCruisers for your grille badge! BIGGUY, Hannibal, Thorn661 and 1 others like this. Congrats! Great stories, great rig, and a well deserved choice for member of the month! Congratulations. I enjoyed reading about you and your trucks very much. Thanks for sharing. I am going to check out your thread so I can see more photos. Congrats and thank you for all that you have contributed to the forum! Congratulations, friend. I always enjoy your tales and your knowledge of all things FJ, offroad, adventure, and great times. If it weren't for you, I'm not sure that I would've become so hooked on a new forum and meeting new people with similar interests. Thanks for the eye opener, BG! Definitely one of the people that represents the best parts of this forum!! ZerosFJ, amaclach and CabinCruiser like this.